When the team sent goaltender Peter Budaj down on Friday, and assigned defenseman Damir Sharipzyanov to the OHL, that left 30 players remaining on their training camp roster. Barring a last minute trade, and nothing is imminent on that front, we’ve learned the team plans to place forward Brian O’Neill, defenseman Vincent LoVerde, and goaltender J.F. Berube on waivers. If they clear, they’ll be sent to AHL Ontario. Joel Lowry is listed as injured and does not need to clear waivers to go down to the AHL, nor will he make the NHL roster. That gets the team down to 26 players. The three remaining spots to trim come down to one forward and two defenseman. From what we’ve been told, as much as Michael Mersch has impressed management (and the general belief is he will likely be in the NHL at some point this season), there just isn’t room for him right now on the NHL roster. Thus, look for him to open the season in Ontario. Also, to put it differently, they just aren’t interested in giving Andy Andreoff away for free on waivers. 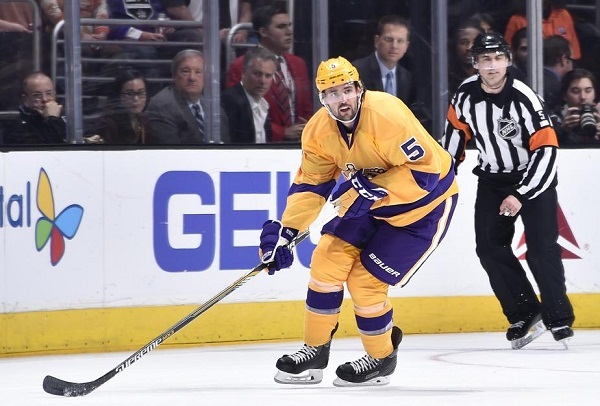 They liked what he did at the AHL level two seasons ago and hope that he will take on a bigger role than the ultra-limited time he saw in a Kings uniform last season. On the blueline, it comes down to three players – Derek Forbort, Jamie McBain, and Jeff Schultz – vying for one spot (as the seventh defenseman). 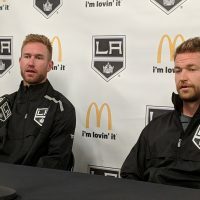 Forbort does not require waivers, and we’ve been told unless something changes dramatically in the next 48 hours, he is most likely headed to the AHL to start the season. The final decision comes down to the health of Matt Greene and Jake Muzzin, which will be re-evaluated on Monday. All things being equal, McBain is set to get the spot. The thinking is, although Schultz is a good option on D, the hope is (like last preseason) his $850K contract will be enough to dissuade other teams from claiming him. Obviously, if Muzzin and/or Greene end up on IR to start the year, that creates an extra spot or two, which makes the decision that much easier… but only temporarily. Of course, you can expect coach Darryl Sutter to rotate Shore, Lewis, and Weal in and out of that third line center spot. Also, McBain-McNabb should see plenty of time early on as a defensive option. 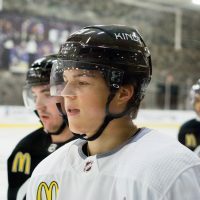 Coming up next, the first of our three-part look at the Kings Top 10 Prospects – our annual preseason rankings of the organization’s top assets. Until then, you can view the last published rankings here. The fourteen forwards who would make the team has been pretty obvious for months. Problems with faceoffs likely on the fourth line. People think Lewis can play center and left wing in addition to being in his usual spot on right wing. It’s true he can play center and left wing, he just can’t play them very well. He’s poor in the circle and is no playmaker. He’s fine as a fourth line right winger and penalty killer but pretty useless otherwise. Andreoff is much like Colin Frazier-nearly the same player. He’s a question mark as a faceoff man as well, however. Weal is too small for Sutter. He could be effective filling in for players at both wing and center. He has speed and skill which is lacking in some spots in the lineup. It’s a big mistake sending Forbort down. He’s a definite upgrade in talent over Greene or Schultz. McNabb is effective despite his terrible skating issues. If he makes a bad read, he has zero ability to recover. He is best suited to a third D pairing. Mersch is a terrible skater but is quite effective in the offensive zone. Some players life Clifford got better skating-wise but Mersch is unlikely to improve much. He’s heavy footed and his technique is nearly unfixable. The Kings will just have to live with that going forward. Hopefully he’ll get a shot at the big club before the season is over. Gravel looks like he will be really good. In the last exhibition game he played for the Kings he was their best defenseman. After watching last night’s game, it’s clear the Kings have some potential problems. 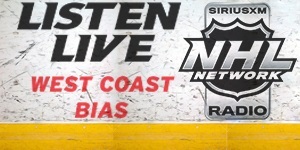 Despite Sutter’s comments after the game Ehrhoff did not play well. It begs the question how much hockey is left in his tank at age thirty-three? McNabb is useful but more a bottom of the defensive rotation player. Martinez is considerably better on the left side. Greene’s play went way downhill last year especially as a penalty killer where he had previously made most of his positive contributions. He’s unlikely to get better considering his age and injury history. 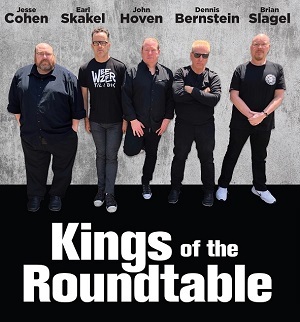 The Kings are being stupid about not advancing Forbort and Gravel as quickly as possible. The defense is a potential mess! Lucic has done absolutely nothing so far except his fight against the Ducks. It remains to be seen if he will fit into the first line. Kopi still won’t go to the net consistently out of fear. As a result he’ll have his yearly scoring drought. Who can win faceoffs as the fourth line center? There are a lot of good teams out there now especially in the West. Despite the win last night, I’m worried about the Kings not being deep enough to again win the Cup. There is talent on the team but several weak spots that can be exploited. Part of the problem with the young players is the scouts and developmental staff understand their talents and abilities better than Sutter who only cares about their serviceability in terms of his line-up. He wants the max effort out of them but only sees them as defensive (puck possession) chess pieces to be used accordingly. Others in the organization realize he is wasting the staff’s efforts by not letting these players develop by giving them ice time. DL needs to force Sutter’s hand. You can not lose talent and waste draft choices in today’s NHL. It’s too competitive. That’s a crack in the organization DL needs to cement, and quickly. To my eye it appears 1/2 of the defense is a mess and LA is wasted time with McBain and Schultz. Ehrhoff has skills but is not a playoff performer and falters in difficult circumstances. His playoff performances are weak. Last night he failed to read a four man deep situation. Weil (jury is out) and Shore do not fill the shoes of Stoll and Richards. Frobert and Mersch will not join the club due to waiver and coaching issues. Andreoff is…what, trade bait? 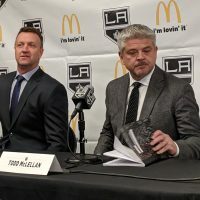 LA simply may not have the resources (or due to waiver issues, time) necessary to overcome the upheaval within its player organization – essentially cutting a year from the player development system. I’ve previously read your comments on another blog and have always respected them. There are a couple of other posters elsewhere I’ve also particularly respected as well, namely CB14 and Puck 73. I mostly agree with your comments but do believe Shore may be O.K. defensively as an NHL center. 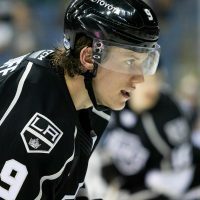 He seems pretty decent on faceoffs and brings more speed to the team than Stoll who I was happy to see leave the Kings. McBain is useful as a part-time third pairing D-man and is good on the power play. I agree Schultz is a total waste of time. The Kings are relying way too much on Ehrhoff and right now they could really use Sekera. I believe DL thought he was going to have VV back sometime this season, miscalculated, then the Kings took the high moral ground after realizing he wasn’t going to be available. The fact that Paul LaDue didn’t sign this off season and went back to college has also affected the depth on defense within the organization. He’s a right handed shot the Kings really like, I think. Thank you for the kind words. By filling shoes I meant 13-14. Under normal circumstance last season should have been a build to position LA for 15-16. Plenty of thoughtful points here @Crown Royal and you may well be proven to be correct WRT the emerging lack of depth down the lines, an area of the team that is near and dear to my own heart. To address the value of the contributions of one of the players’ about whom you are concerned, sure, Trevor Lewis will never quite be a winger of the hardness of Dustin Brown, nor a center with the skills and faceoff capabilities of Mike Richards. However, last season he darn near eclipsed both of those (erstwhile) team leaders in what he brought at winger and center respectively. Of course, he hits cap at a fraction of those two gentlemen and somewhat less than one or two others who underperformed last season. This is important to factor in. Meanwhile, Trevor is on the up and up, having broken personal goals and points thresholds last season and has come into camp looking every bit as conditioned as, and perhaps even a little better on his skates than he he was previously, as was keenly noted by Bob Miller a game or two ago. Regardless of pleasant dreams of the possibly of him not having hit his career ceiling yet, we must always take into account the reality that Trevor is on this club primarily for his defensive efficacy, an exceedingly economical and positionally sound soldier who will eat up important minutes for you and can play/fill in admirably in any of the 12 forward slots in case of injury or other issues and herein, in his ultra dependability and ever increasing experience quotient, lies his true value to the Kings. Players like Trevor supposedly grow on trees but a fair few fans feel that suggestions like this are selling the man unfairly short. This coming season you will once again observe him correctly doing the job that’s cut out for him on this club and making his coach and GM amply happy in the process. The fear is that should those points scoring numbers continue to increase – and from the way he’s performed preseason there’s no reason to believe that they shouldn’t – with his contract coming up for renewal in July his value may increase beyond what the team can afford. Or, perhaps there will more surprises in store (10, 26, 28) and to our eternal joy Trevor will become unaffordable to be let go! TL gives an honest effort and has very good, but not great speed. Not especially strong on his skates but seems to play with an intelligent bent to his game. He was destroyed last night in the faceoff circle. Keep in mind if DS uses him as a penalty killing center rather than as a winger, he will be facing the best faceoff men the other teams have available in order for them to secure the puck immediately on the PP. This does not bode well for him as a potential center. He’s best suited to right wing where he does have value to the team. Geez guys, not ONE regular session game has been played. Important to note that some of the kids will still benefit from getting Top 6 and Top 2 pairing time on the farm rather than playing in lower positions and or sitting out games. Sending them down to the minors will allow them to develop a bit more and contribute more when they get called up. The season hasn’t started yet and there may be a bit of a rocky start but it is up to the core to get the season off to a good start as they try to prove themselves after last year’s disappointment. Let’s hope the kids that can still move up and down can continue to improve as the season progresses, and then can give the team a shot in the arm when they are brought up mid-season. Having the minor league team close is going to make it easier to evaluate and move kids up and down. Yes, it’s true some will benefit. Others will suffer as they are ready to play in the big club and don’t experience the next level of competition which they need to continue developing. Playing older players with less talent often hurts the organization in the long run. Ask the New Jersey Devils about it. Good article today on the TSN hockey website. David Conte long time Devil executive (director of scouting) admits not bringing the young players up soon enough eventually hurt that organization.